Callington Town, Portishead and Sutton Coldfield Town all secured divisional titles, while more could be settled this midweek. 1 SOUTH – The final game of the season saw Hutton win 6-1 at Hertford Town but the margin of victory was still not enough for them to overhaul third-placed Little Thurrock Dynamos. Katie Lowen and Kelly Roberts both bagged a brace, Laura Allen and Kaitlin Sugg one apiece, while Claire Pavett got the hosts’ goal. PREMIER – Ollerton Town managed to secure a top-half finish with the 2-1 defeat of Kettering Town, despite only having nine players. LEAGUE CUP – A flurry of second-half goals saw Northampton Town thrash Eastwood 8-0 in the final. Emma Dunmore led the way with a hat-trick, Leah Stacey scored twice, Naomi Dauncey, Francesca Speck and Georgia Tear adding one each. LEAGUE PLATE – There were also eight goals in the Plate and most of those after the break too, as Peterborough Northern Star beat Oadby & Wigston Dynamo 6-2. Emily Miles scored in either half for Oadby but Katie Steward got a treble for Star, with two for Cassie Steward and one from Vicky Gallagher. 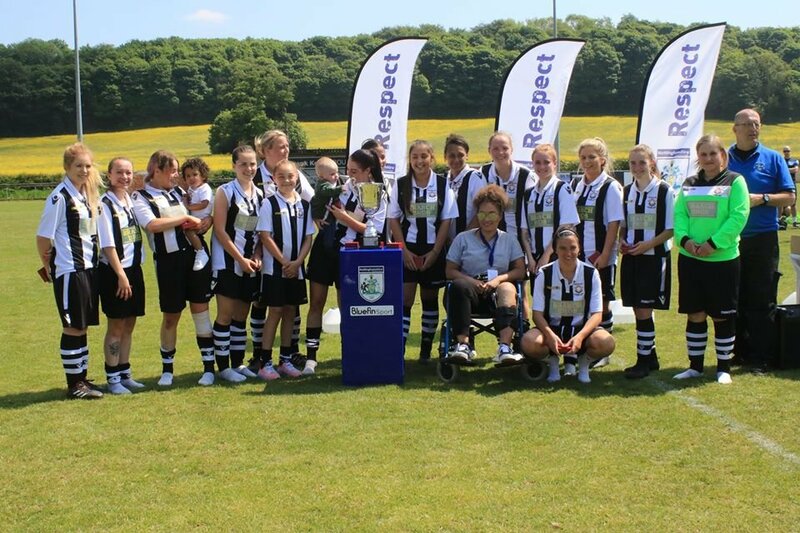 PREMIER CUP – League runners-up AFC Phoenix edged champions Crawley Wasps 3-2 in the final at Maidstone United FC. Twice in front, the Wssps were twice pegged back before Phoenix won it in added time. L&SE PROMOTION PLAY-OFF – The South East Counties and Greater London runners-up met to contest the extra promotion place to the L&SE Premier, with QPR DS defeating Meridian 5-3. 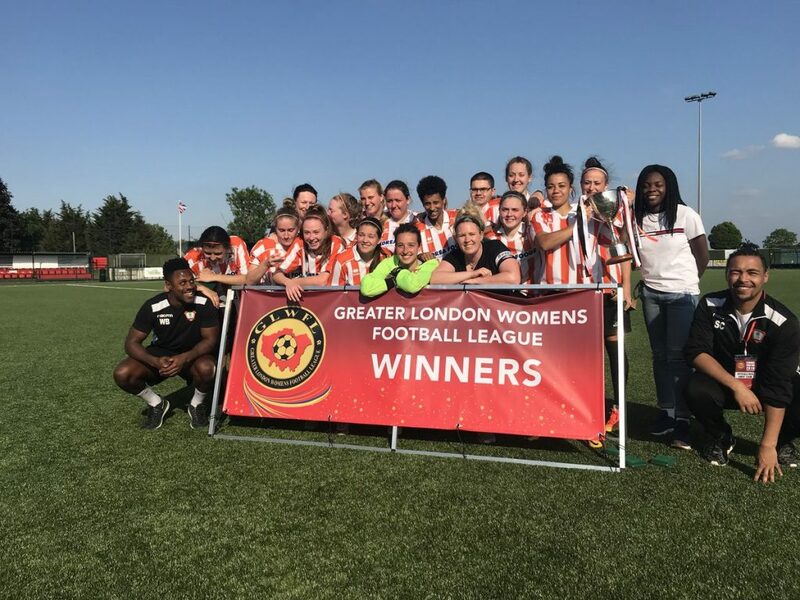 GREATER LONDON LEAGUE – Ashford Town (Middx) won a goal-fest of a John Greenacre Memorial Trophy (League Cup) Final 8-4 over Godalming Town, Ashley Cheatley with a treble for the victors. 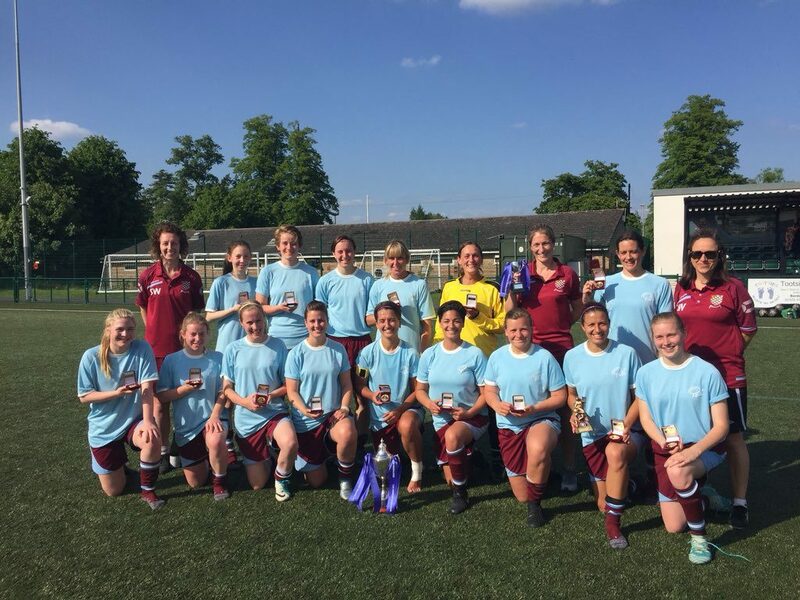 AFC Phoenix Reserves made it two cups in one day for the club with a 4-2 defeat of Islington Borough in the Trophy final, Raquel Arevalo and Rebecca May with two each. The Sue Sharples Memorial Trophy was decided on penalties as South East Parakeets edged Alexandra Park 3-2 following a 1-1 draw. SOUTH EAST COUNTIES PREMIER – Herne Bay may have finished bottom but did not make it easy for champions Kent Football United, against whom they scored four but conceded six. Effie Dodds came off the bench to get their fourth but a Rachel Stevens double was crucial for the visitors. Ashford Ladies won the decider for eighth place 4-1 against Hassocks, aided by a couple of goals from Maisie Cannon. PREMIER – Norton & Stockton Ancients missed a chance to clinch the title when going down 4-1 at Hartlepool United, Caitlin Bates’ brace helping Pools seal third spot. Norton go to fourth-placed Farsley Celtic on Wednesday only needing to avoid defeat to stay above Durham Cestria and be crowned champions. LEAGUE CUP – Chesham completed a league and cup double with a 3-1 scoreline over Division 1 South winners AFC Bournemouth. Gemma Fraser got all three for United, Chloe Tape with the only goal for the Cherries. CHAIRMAN’S CUP – Oxford City lifted the trophy after beating Winchester City by the odd goal in five. Mollie Dyer and Lauren May scored in a three-minute second-half spell for City and although Hannah Chaffey and substitute Kayleigh Moss replied for the Flyers, Emily Green got the winner for Oxford with 7 minutes left. 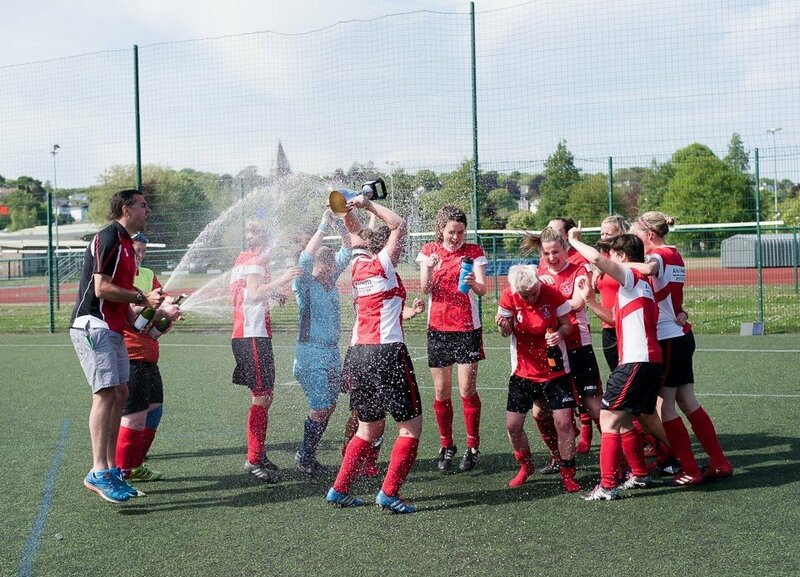 PREMIER – Champions Buckland Athletic finished with a 2-0 win over Torquay United, as Amber Coates and Carla Staddon found the net. Exeter City are still chasing third place after a 7-3 defeat of Middlezoy Rovers in which substitute Lannece Hole scored three times. The Grecians next play on Wednesday at Keynsham Town DS, who were beaten 3-0 at home by Marine Academy Plymouth. A 2-2 tie for Bishops Lydeard at Charlestown was enough for them to end up seventh on goal-difference. Ilminster Town condemned AEK Boco to the drop zone with a 7-2 defeat in which Erin Bloomfield got a hat-trick and Shannon Crouch came off the bench to score twice. 1 EASTERN – Portishead were gifted the title on goal-difference from Wootton Bassett Town after being awarded the game at fourth-placed Almondsbury. Wootton were nine goals behind the champions despite a 3-0 midweek win at Cheltenham Town DS. Four goals from Katie Wadey saw Swindon Spitfires win a 5-3 derby thriller against Swindon Town DS. FC Chippenham went seventh with a 3-2 defeat of Frome Town in which Kathryn Kilgour got a couple. 1 WESTERN – Callington Town came from 2-1 down at the break to win 3-2 at Plympton and clinch top spot, Lucy Bounsall, Gemma Farley and Amy Hemingway with their goals. Alphington host runners-up Plymouth Argyle Reserves on Thursday. PREMIER – Bedworth United went top with a 2-1 midweek success at Crusaders but Leafield Athletic regained the leadership with Sunday’s 7-0 sinking of Knowle, which included an Amy Andrews double. Bedworth will win the league if they take maximum points from their final game tonight (Tuesday) as they host third-placed Stockingford AA Pavilion. 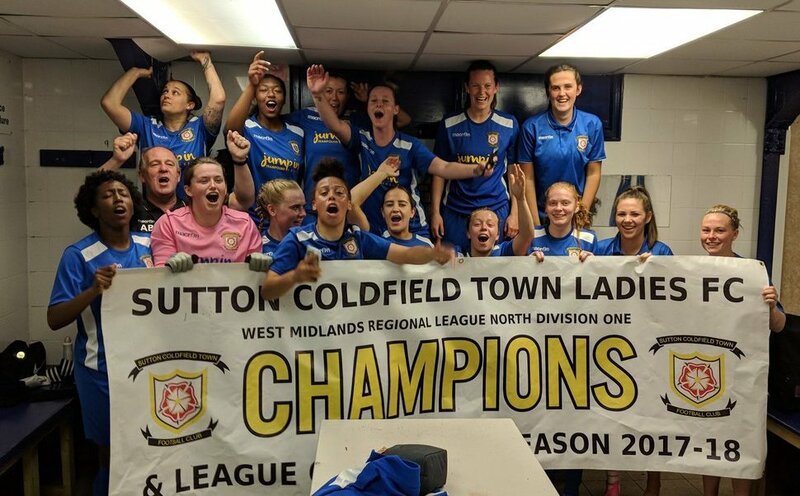 1 NORTH – Sutton Coldfield Town secured first place with a 3-0 win in the massive match against third-in-the-table Goldenhill Wanderers. Shrewsbury Town have two home games this midweek, versus Tamworth on Tuesday and Goldenhill on Thursday, before hosting the unbeaten champions on Sunday. 1 SOUTH – Coventry Sphinx have one hand on the trophy following a 3-2 win at Solihull United, which put them a point ahead of title rivals Redditch United. However, they finish up at home to Redditch on 27th May.